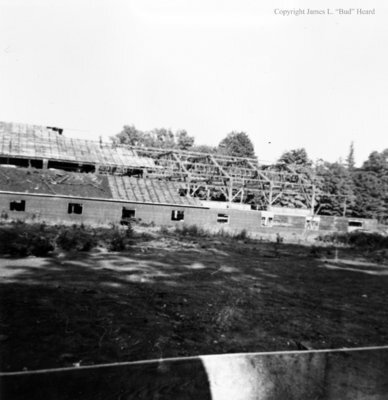 Black and white negative showing the demolition of Ernie Taylor's arena. The arena was located on the block bound by Brock, Ontario, Green, and Gilbert Streets. This view is looking east from Brock Street. Taylor's Arena was built in 1913 form the remains of the Barnes arena built in 1889, and demolished in 1953. It was replaced by the Whitby Community Arena in 1954. Demolition of Taylor's Arena, 1953, James L. "Bud" Heard. Whitby Archives A2014_002_008.